Senate Bill 413 passed the Roundhouse and obtained the Governor’s signature. The good news broke Wednesday night at the top of the page listing bills signed into law by Governor Michelle Lujan-Grisham. Senate Bill 413, which we profiled just recently, got the signature that craft breweries were hoping for and will become effective on July 1. To sum up the benefits of the bill, breweries will now be able to sell beer at 11 a.m. on Sundays (no more waiting until almost halftime of NFL games); they can have private celebration permits for events like weddings, graduation parties, and so on; there will be minimum standards (50 barrels a year or 50 percent of all sales coming from beer brewed on site) for businesses to hold a small brewer license; and the excise tax has been ironed out, with breweries paying $.08 per gallon on the first 30,000 barrels produced. There are also benefits for cider producers and craft distillers. In a legislative session crammed with so many bills, and an uncertain environment with the change in governors, no one was quite sure if the bill would pass. Thanks to State Rep. Javier Martinez and Senator Mimi Stewart, Guild lobbyists Al Park and Jason Weaks, and the tireless work of Tractor Brewing co-owner/president Skye Devore (who publicly spearheaded the Brewers Guild’s efforts), this bill not only passed both houses, but it reached the governor’s desk. At that point, all everyone could do was wait and hope it would not come down to Friday’s final deadline. Thankfully, that wait ended Wednesday night, as Rep. Martinez tweeted out the news of the bill being signed, and a whole lot of online congratulations followed throughout the New Mexico craft beer community. All supporters of craft beer owe a huge thank you to SB413 sponsors Rep. Javier Martinez and Senator Mimi Stewart. Senate Bill 413 is one of many sitting on the desk of New Mexico Governor Michelle Lujan-Grisham after the completion of the 2019 Legislative Session. It is, however, the one that will specifically affect our craft breweries, in a very good way, if it obtains her signature. I sat down with Tractor Brewing co-owner/president Skye Devore, who spearheaded the effort on behalf of the New Mexico Brewers Guild, on Friday morning to go over what SB413 will mean to breweries if it is passed into law. The bill is pretty much as originally described by outgoing executive director John Gozigian, combining everything our breweries had hoped for into one bill in this legislative session. It passed the Senate by a 36-2 margin and the House by a 54-10 margin. Cheers to the Brewers Association, not just for GABF, but for also fighting the good fight in D.C.
WASHINGTON, DC — Leaders of the Beer Institute, Brewers Association, Distilled Spirits Council of the United States, American Craft Spirits Association, Wine Institute and WineAmerica released the following statement after Senator Jim Inhofe (R-Oklahoma) became the 51st member of the United States Senate to officially endorse the Craft Beverage Modernization and Tax Reform Act (S. 236). Senator Inhofe co-sponsoring the bill means that now a majority of members from both the House of Representatives and United States Senate support this legislation. Introduced by Senators Ron Wyden (D-OR) and Roy Blunt (R-MO) in January, the bipartisan legislation creates a fair and equitable tax structure for brewers, winemakers, distillers and importers of all beverage alcohol, which will allow them to continue to invest in their businesses and grow jobs across the country. H.R. 747, identical legislation introduced in the U.S. House of Representatives by Representatives Erik Paulsen (R-MN) and Ron Kind (D-WI), has also garnered 281 co-sponsors from both sides of the aisle. After a year in which members of the New Mexico legislature tried to raise taxes on breweries, it is awfully nice to see the federal government step up to help small businesses. We will check in with our local breweries later this week to see what these bills could mean around here. Good news from the state legislature? What sorcery is this?! Glorious news from Santa Fe, as House Bill 398, the last remaining piece of legislation aimed at increasing the excise tax on local breweries, wineries, cideries and distilleries, has been tabled in committee. HB398 was squashed by a 5-2 vote in the House Health & Human Services Committee this morning. The bill seemed to stand little chance of passing after its companion piece, Senate Bill 314, was tabled in committee weeks ago. With the legislature’s website currently offline, further details were not available, but in the end the bill was tabled, and that is all that matters. A huge thanks to NM Brewers Guild director John Gozigian for sending us the good news. Hopefully in the waning days of this session, the governor and legislature can agree upon a budget that helps fund New Mexico schools, creates jobs, and protects local business. For now, though, the breweries that are already taxed at twice the national average will not be taxed any further. They will still be able to grow, create jobs, and help our state’s economy beyond simply paying more taxes. Now we can just get back to enjoying beer and writing about it. That, more than anything, is the best possible way to start our weekend. Well, that and attending the Steel Bender Brewyard event tonight. Look for our full preview on the newest brewery in the metro area early next week! The folks in the Senate have done good, but the situation is far from over. SB 314 was finally debated yesterday evening, beginning at 8 p.m., in a hearing that resulted in the bill being tabled by a majority vote of senators on the committee. This is good news; this means that the committee members agreed that the proposed tax rate was thoroughly unreasonable and made the bill unviable as written. Another point that came up in the hearing was the tone and tenor of rhetoric coming from some opponents of SB 314. To be clear, the Guild, and the brewers of New Mexico we represent, are committed to a policy of civil discourse in all of our interactions with those on either side of issues that impact our industry. Passion is a useful tool; passion tempered with civility and reason is even more powerful. Looking ahead to HB 398, the House bill that mirrors SB 314, we’ll continue to work with our many supporters on both sides of the aisle in the New Mexico Legislature. A hearing on HB 398 has not yet been scheduled, but we will keep you up to date on developments as they occur. All right, so the good news is SB314 is basically dead, and it seems reasonable to hope that the members of the House committee will vote the same way on HB398. The Guild has a point, though, in that second graph, to please keep things civil when contacting your representatives to voice your opposition to these bills. The supporters of the bill have claimed the moral high ground, so logical discourse, not passion, is the true key to defeating them. We will have more info as events continue in Santa Fe. Today is the day SB314 goes before a committee, which could vote to keep it from ever reaching the Senate floor. The seemingly glacial pace of the state legislature is thawing, with the now-infamous Senate Bill 314 finally getting its hearing today (Monday) before the Senate Corporations and Transportation Committee. The bill is listed second on the docket, though it does not necessarily mean it will be heard in that order. There are eight bills in total scheduled to be heard today. Based on our communication with the New Mexico Brewers Guild, this could be the end of the line for the bill that seeks to substantially raise the excise tax on beer and other forms of alcohol. Of course, it does not mean the fight is over, as House Bill 398 has also been introduced, offering up almost the exact same wording. The sponsors of the two bills, Albuquerque-based Senator Cisco McSorley (D) and Las Cruces-based Representative Joanne Ferrary, will be hosting a press conference in Santa Fe around the same time SB314 will be learning its fate. In a surprise to no one, this presser was announced by Peter DeBenedittis, the leader of the group Alcohol Taxes Save Lives & Money. It has always been his group, which seeks to eventually ban alcohol in New Mexico, that has been behind these bills. Here is the full text of the email that DeBenedittis sent to the media (we were not included, but another reporter was kind enough to send it to us). It lays out his reasoning, though it does not include just where he gets all of his statistics from, but basically, if you like to go out and drink beer, you are painted as his enemy. Please join Senator Cisco McSorley (D-Bernalillo) & Rep. Joanne Farrary (D-Dona Ana) for a Press Conference on their bills to address the deaths, health problems being subsided by New Mexico’s low alcohol taxes. Over 7,000 fewer underage drinkers a year. Data from Research and Polling shows 76% of New Mexicans support these bills. Right now state taxpayers foot an $800 Million a year bill for the extra police, court cases, detention, ambulances and medical care caused by excessive drinking. These bills help correct the problem by raising $160 Million in revenue from those causing the problems. Half of New Mexicans haven’t had a drink in the last 30 days and won’t be affected by an alcohol tax increase. Responsible drinkers will pay an average of less then $10 a year more, while the 19% of New Mexicans who drink excessively will pay 3/4ths of the increased tax. Please join Senator McSorley and Representative Farrary at 10:30 AM on Monday, February 20 in room 318 to hear their statements and answer your questions. We would love to see where he gets some of that data. The 76 percent support the bills part is bad enough. Honestly, though, half of the people in New Mexico have not had an alcoholic in the last 30 days? Is that just adults or is he including children in that? Also, for those who have criticized our coverage of this issue by arguing that breweries and other entities must pay their share to help fund our schools, take note that nowhere above does it say these new taxes will go to education. Instead, they are aimed at covering one-fifth of the total cost of excessive drinking in New Mexico, or so DeBenedittis wrote. Due to our day jobs and such, it is unlikely that any of the Crew will be in attendance. If anyone out there is able to go to the press conference, please, record the session and send us the audio. We will give you a Crew supporter T-shirt for free or buy you a couple pints. Other media entities may be present to take notes, and hopefully someone from the Guild will be there to represent the breweries, but the more sources we have, the better. We will monitor how these events turn out today and report back to all of you as soon as we have the confirmed information. Stay vigilant, craft beer lovers. Yup, they’re at it again in Santa Fe, with members of the House of Representatives introducing a bill to raise the excise tax. It appears that the old cliche, monkey see, monkey do, is alive and well at the New Mexico State Legislature. House Bill 398 has been introduced as the mirror version of Senate Bill 314, with both seeking to make serious increases to the excise tax on multiple forms of liquor, including craft beer. This bill has been sponsored by representatives Joanne Ferrary, Miguel Garcia, and Rudy Martinez, a trio of Democrats. Ferrary is from Las Cruces, Garcia is from Albuquerque, and Martinez is from Bayard, a small town near Silver City. It will head to the House Business & Industry Committee, though no date for a hearing has been scheduled. Just like SB314, it will raise the excise tax from 41 cents per gallon to $3.08 for all beer produced above 15,000 barrels per year. That would likely cap any future growth by rapidly expanding breweries such as La Cumbre and Bosque. It might also force Santa Fe and Marble, both of which are already producing more than 15,000 barrels, to rethink their strategy going forward. The only difference between the two bills that we can see (note, we are not lawyers, so there could be subtle bits lost in the legalese of the seemingly identical paragraphs) is that there is no mention of cider in HB398. Hooray for that, at least, though these bills change so often they might add that again later. The New Mexico Brewers Guild has been working hard to stop SB314 from even getting past the committee stage, but now it will have to double its efforts to stop HB398. As we have with SB314, we will keep an eye out for news about this new bill and share it with all of you. If anyone out there hears about anything, even a town hall involving the bill sponsors, please email us at nmdarksidebrewcrew@gmail.com as soon as possible. In the meantime, keep supporting our craft breweries the best way you can, by attending their events and drinking their beer. Thank you to the Guild for sending out this extremely helpful infographic. Legalese translated to English! The Friday revelation that members of the New Mexico state legislature were pursuing an increase in excise taxes caught many of us by surprise. Senate Bill 314, an updated version of the same legislation proposed by the neo-prohibitionist group Alcohol Taxes Save Lives and Money, was dropped on an unsuspecting public by State Senator Cisco McSorley, a Democrat whose district includes Nob Hill. McSorley invited the the public to a town hall meeting at Nob Hill church on Sunday afternoon, prior to the Super Bowl, to discuss all the items he and Democrats from the House of Representatives are dealing with during the current 60-day session. A crowd estimated at 300 people, many of them wearing New Mexico Brewers Guild shirts reading “Support Local Beer,” showed up. It was contentious from the get-go. As McSorley began speaking of how SB314 would not harm local breweries, La Cumbre owner Jeff Erway yelled “Liar!” prompting a hostile response from the senator, who threatened to have him thrown out if Jeff interrupted again. There was no security present, so one had to wonder if McSorley expected his mostly elderly supporters to help, or if he actually expected the police to show up if called. Things calmed down from there as he got on with the rest of the SB314 portion of his speech. “The point is, it’s $800 million that it costs the state in DWIs, judges, prison, jail, all those things, plus it goes onto your insurance,” he said, clearly stating his case that an increased excise tax is to pay for the state’s DWI problem, as well as making it personal by bringing up people’s own insurance premiums. Breweries above 15,000 barrels of production per year are subject to a whopping increase of their excise tax from 41 cents to $3.08 per gallon. Santa Fe and Marble would both be hammered by this, as would other breweries looking to surpass it like La Cumbre and, down the line, Bosque. All of these tax increases would then go up even higher, as tied to the federal inflation rate, every four years. The excise tax on cider would also go to $3.08 per gallon, which would all but wipe out the cider industry in this state, including for breweries that produce cider such as Tractor, Boxing Bear, and Red Door. After going over multiple other bills, a mix of those McSorley thinks will never get by Governor Martinez (whose name was booed every time he said it) and those he said he hopes will get passed. Eventually, after the state reps had their chances to speak, McSorley got back to SB314. Jeff and an unidentified craft beer supporter were both able to ask more questions. McSorley answered both, though clearly to neither man’s satisfaction, dodging definitive answers in a classic political style. McSorley saying he may raise the number “a little bit” for SFBC will not cut it. SFBC is planning to reach 50,000 barrels in the next couple years with a final goal of 200,000 barrels, 10 times its current output. Raising those numbers “a little bit” will not nearly be enough. It still goes back to the Guild saying this bill will discourage growth by local breweries, and basically stop them where they are now. When Jeff challenged McSorley’s answer, he snapped back (again) and repeated his claim that the bill would not harm breweries one bit. “The local breweries are being left alone, except I might raise the limit (of barrel production) on what is the definition of a local brewery,” McSorley said. Whether he has decided to ignore the Brewers Association guidelines of what constitutes a craft brewery or is simply unaware, well, that is a question for another time. The mostly older crowd that attended the town hall. By the time it started, there was almost no room to move in the north room of the church. A soft-spoken person asked the next question, which gave McSorley a chance to show off his tactical plan of attack against his critics and to drum up public support for the bill. The mostly older, mostly Democratic audience laughed and applauded. McSorley has made it clear that he believes, or at least publicly states, that the DWI problem is caused by young people with fake IDs. This makes it an old versus young issue, and since the majority of people who vote tend to be older, it again shows off his strategy. He is making it a moral issue, a fiscal issue with education at the center, and now a sort of it-will-stop-bad-young-people issue. A final supporter challenged McSorley to the wording of his bill, but McSorley dodged the question and repeatedly told the supporter to just read it. After the town hall concluded, Jeff and McSorley continued their dialogue, in a much calmer and more peaceful tone. Other people in the crowd approached the clusters of craft beer supporters, including myself and members of the Tractor Brewing staff. One woman, who identified herself only as a teacher with Albuquerque Public Schools, lambasted us for “trying to dominate the discussion.” She said schools are in desperate need of money, and this tax will pay for those needs. She also claimed that teachers make up the majority of craft beer drinkers (really? Wow) and that if the breweries and their supporters do not back off, teachers will en masse boycott breweries. While what she said might sound silly, do not be surprised if this becomes a new tactic in the supporters of the bill. The number of New Mexicans who want to ban alcohol, even as a means of fighting our DWI problem, are still small. Most are smart enough to realize that prohibition never works. But, switching tactics and making big, bad alcohol the enemy, and poor, suffering teachers and children the victims here, is unfortunately a brilliant strategy. McSorley hinted in his comments that he plans to see the tax money go to schools, and expect him to push that agenda forward. Save the children at the expense of business. A dirty, underhanded tactic? You betcha, but this is politics, and we cannot be surprised that they would stoop this low. Throwing more money at the DWI problem will not make it go away. Putting repeat offenders behind bars for good, improving treatment programs for first- and second-time offenders, and improving public transportation throughout the metro area (not just along Central) are all ways to combat what is a real problem. Blaming breweries for the problem and taking away money and jobs is not the answer. The good news, according to the Guild, is that five of the nine committee members who will hear SB314 have been allies of our craft beer industry in the past. If they hold fast against people trying to moralize a tax increase, SB314 will die before it ever reaches the senate floor. Once there, it remains to be seen which way the political winds are blowing. By all accounts, the Governor will veto any tax increase that Democrats put on her desk. This cannot come down to an alcohol versus kids debate. The breweries, as well as our state’s wineries, cideries, and distilleries, will lose that fight. It has to be a debate about jobs. If SB314 passes, it will stop brewery growth, and job growth, dead in its tracks. It would only offer a short-term revenue boost to the state, because some larger breweries would move away, while smaller ones would simply close up shop. There are nearly 70 craft breweries operational in New Mexico, employing hundreds of locals, and supporting numerous other local businesses and charities. They are generating revenue into the hundreds of millions. For a one-year tax boost, would this state really wipe out one of its only growing industries? One that is locally owned and now becoming a part of the tourism this state desperately needs, it should be added. Somehow we hope, no, we believe cooler heads will prevail and SB314 will never come to pass. In two years, though, Martinez will be gone, Democrats will still control the legislature and likely have one of their own in the governor’s office. If New Mexico has not solved its financial woes by then, all bets are off for every industry in this state. We will keep everyone as updated as possible, starting with the date the committee hearing will be held. We also hope to sit down with Jeff and other key brewery and Guild personnel in the near future so that we may understand this situation even better than we do now. In the meantime, just keep supporting your favorite breweries in any way you can. Hopefully this storm will pass soon and we can just get back to arguing about who has the best IPA and nicest patio and so on. Another bill that impacts craft breweries goes up for a state legislature committee vote this week. The good folks out at Ale Republic alerted us to the fact that the first notable piece of legislation that affects craft breweries comes up this Thursday in Santa Fe. A new reciprocity bill is due for a vote before the House Consumer and Public Affairs Committee, which meets at 1:30 p.m. in Room 309. Representative Stephanie Garcia Richard has introduced a bill to expand the existing reciprocity between New Mexico breweries and wineries to now include craft distilleries as well. The current law allows breweries to also sell wine, as long as it is made in the state, without requiring a wine license. In turn, wineries can add craft beer taps from local breweries. If the new bill passes, distilleries such as Broken Trail, Left Turn, Santa Fe Spirits, and more will have the same ability. At present, a distillery can only have beer on tap if it has a small brewer license. Basically, you could go to a single New Mexico liquor-producing entity and you could have a mixed drink, a glass of wine, and a pint of beer, so long as all are made within the state. (We would recommend you do not drink all three without a designated driver/Uber/Lyft/taxi at hand.) The full text of the proposal can be found here, but be forewarned, it is written in that nebulous legalese that has befouled many a person. Five state representatives sit on the committee — Eliseo Lee Alcon (District 6/Cibola and McKinley Counties), Deborah A. Armstrong (17/Bernalillo), Patricia Roybal Caballero (13/Bernalillo), Bob Wooley (66/Chaves, Lea, Roosevelt), and Monica Youngblood (68/Bernalillo). If any of them are your state rep, and if you support the passing of this bill, please contact them and encourage them to vote yes. Use this handy feature to find your rep and contact him or her. If you have any questions, contact us, or you can contact Patrick Johnson of Ale Republic at patrick@alerepublic.com. Once we find out the results of the committee vote, we will share it here. The State of New Mexico may be on the verge of severely damaging our craft brewing industry. The State of New Mexico is at it again. Certain legislators want to raise the taxes on alcohol to help balance the budget. While we would all like to see them actually pull off a balanced budget, this sort of move would be disastrous to our breweries, wineries, and distilleries. La Cumbre owner Jeff Erway shared his letter to the editor, which he sent to the Albuquerque Journal after the editorial staff there (which is way more conservative than you might otherwise know for a newspaper) said it was in favor of the tax. Jeff did not know if the Journal would actually publish his letter, so he shared it with us as well. We have reprinted it here in full, because Jeff can describe just what a terrible idea this tax increase is far better than we ever could. Read this carefully, let us know what you think, and if you agree with Jeff, it might be time to start contacting your state representative and telling him/her to vote no should this bill come up in the legislative session in early 2017. 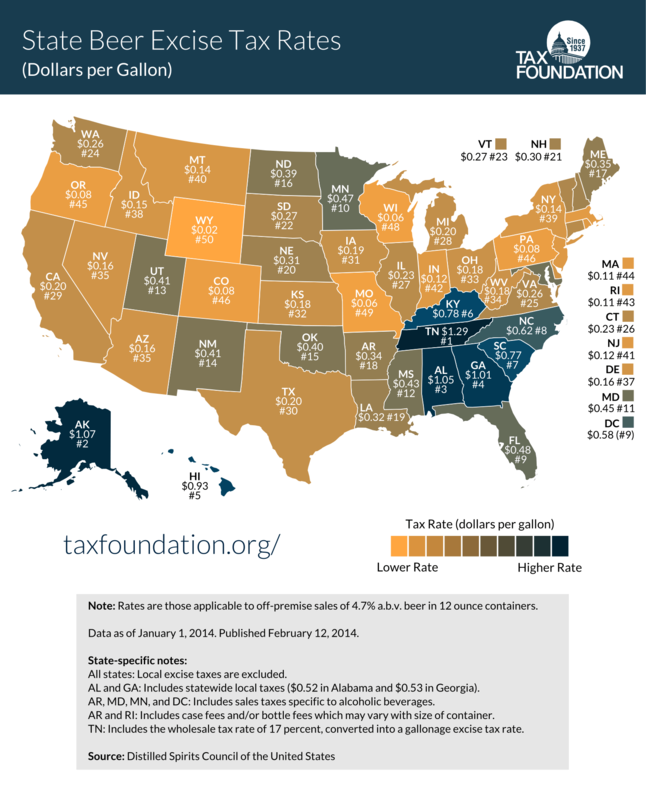 Let’s keep in perspective that breweries, wineries, distilleries and their respective wholesalers and retailers already pay corporate income tax at both the State and National level. The owners and employees of these businesses pay payroll taxes and capital gains taxes at both the State and National level. The retailers already pay a state and local sales tax on all sales. And the producers and wholesalers already pay Excise taxes at both the State and National level. You cannot tax state businesses into prosperity. Despite what MADD would have you believe, this is simply a neo-prohibitionist proposal that is aimed at limiting peoples access to alcohol, and it will hurt the State’s breweries, wineries and distilleries most by making their products more expensive to the end consumer. You will take a local product that is viewed as an affordable luxury and make it unaffordable to our already cash strapped residents. Instead of supporting local businesses, the consumer will be economically forced to support the very largest of producers who can afford to keep their prices and margins at rock bottom. As has been shown time and time again, this will not change the consumption of the heaviest drinkers, just which alcohol is purchased and therefore where that alcohol was produced. According to a study by Willard Manning et. Al in 1995, moderate drinkers are far and away the most guided by the price of alcohol and will simply choose to not drink when prices become absorbent. This proposal is a job killer to the 3 very industries that are actually currently growing in NM. It is a shot in the foot of the State’s economy and employment. I would in no way ask our state to cut funding to schools, health nor public safety, and I personally would not be completely opposed to a consumption tax proposal. That being said, the number of pet projects that are going on around the state that have not been ear-marked for cuts is somewhat appalling and yet your editorial board sees it fit to raise that taxes on the few industries that are working. I wonder how the Journal and its employees would feel if the state proposed a rise on taxes for print advertising. The journal is taxed at a far lower level than the liquor industry is. No, definitely a better idea to raise taxes on the only industries that are adding jobs. We definitely don’t want anyone getting the idea that NM’s economy has any ray of hope left in it. Thank you to Jeff for sharing this. Clearly, craft beer is threatened in New Mexico. Now is the time to stand up and say no to this tax increase. The Crew will keep you all updated as this story continues to develop.